Aspen's Logan McNamee (1) works the ball upfield againt Grand Valley duraing Saturday's game. McNamee had a trio of shot on goal. Break out the radar gun. 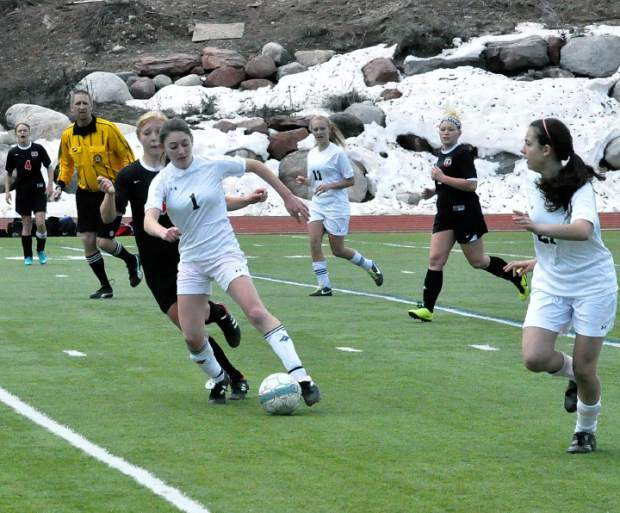 The Grand Valley girls soccer team showcased its aggressive, high-speed attack Saturday on the turf field at Aspen High School. The Cardinals, with intimidating speed up front, sliced through the Skiers for an 8-0 victory in a Western Slope League match. Ashlynn Speakman scored four goals, teammate Lauren Paskett scored twice, and the Grand Valley girls improved to 9-2-0 overall, 5-1-0 in conference play. Aspen nearly shocked the Cardinals in the opening sequence of play when the Skiers drew a foul in the penalty area in front of the Grand Valley goal. Aspen’s Logan McNamee lined up the PK and took the shot. But Grand Valley’s Erin Schuckers made the save — one that woke up the Cardinals, according to Speakman. “Throughout the season, we’ve been working on our through balls and our crosses,” said Speakman, who assisted on Paskett’s opening goal in the sixth minute of the match. With speedster Randi Sheridan forcing play up the left sideline, Grand Valley scored again in the 19th minute — Speakman’s first goal. Sheridan’s cross to Paskett produced Grand Valley’s third goal and a 3-0 halftime lead. But a short roster hit by illness and injury soon left the Skiers behind. Grand Valley scored five goals in the second half. Kyra Chenoweth and Hanna Cornelius also scored for Grand Valley. Chenoweth also provided a corner-kick assist on a header goal by Speakman (her 25th goal of the season). The Grand Valley coach said the Cardinals are reaping the benefits of playing together for a long time. That helps them appreciate the special wins, he said. “We’ve had some tough times on this field (in Aspen), so it feels really nice to come away with a win,” Gregory said. The Skiers, who were outshot 27-6, nearly converted on a pair of second-half opportunities. Melody Lemke had a shot, and McNamee added another. Shannon Waititi and Julia Ely also pushed play into Grand Valley zone. But the Cardinals answered with their stingy defense and the WSL shutout. The Skiers (4-4-1 overall, 3-2-0 in league) were coming off a big 7-0 win at Rangely earlier this week. Aspen will host undefeated Coal Ridge (11-0-0) on Tuesday afternoon. The Titans are ranked No. 4 in Class 3A by chsaanow.com.